Collaborating with U+B Architecture and Design and hospital staff, we developed a Kinect-based interactive video wall within the “Grotto” — a contemplative space for patients and their families at Children’s Pain, Palliative and Integrative Medicine Clinic in Minneapolis. 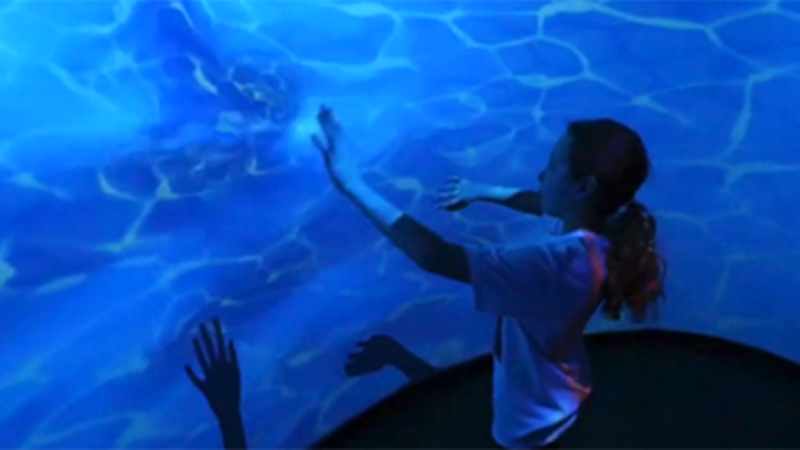 This unique projection wall creates a sensory escape for patients as they use the Kinect to create patterns that imitate the natural flow of ripples and currents in water. We developed the content in Unity3D, enabled for immersive projection with Omnity. An OmniFocus 30200 projection system – now 6,000 lumens bright – fills the 14′-wide room with vivid color, projecting onto curved walls with high-contrast screen paint. The Elumenati worked in tandem with U+B and the Children’s Hospital to help develop and create this calming and anxiety reducing holistic environment for the unique challenges of pediatric pain management. The end result is distinctly unlike any typical hospital interior. Throughout the clinic, natural wood floors and walls rest in combination with state-of-the-art, multisensory spaces where light, sound, and texture serve to stimulate and soothe the patients’ senses.